Data Center Virtualization (DCV): VMware vSphere focus. This is the core of server storage, network connectivity, and the VMware software stack (ESX and vCenter). It also focuses on some of the ancillary products on that set. Cloud Management and Automation (CMA): VMware vCloud Suite focus. This one is centered around vRealize operations, vRealize automation, and some of the next gen stuff that people are taking their data centers to today. Desktop and Mobility (DM): VMware Horizon Suite focus. This is specifically around user computing, how to do VDI, how to manage users, and how to include mobility and device control into that solution. It's really around the end user computing space. Network Virtualization (NX): VMware NSX focus. This is primarily for folks with a networking background that can come in and do virtualized networks. It's not very common for someone to go through and do more than one. There are a few individuals worldwide that hold three out of four certifications. There is even one individual that has all of them, but that requires a huge skill set and a huge undertaking to do so. How Do You Earn One? The only people who will give out VCDX certifications are people who have VCDX certifications themselves. Essentially, you are being judged by those who have attained that certification, very similar to the way Cisco programs handle CCIEs. It is an elite group to be able to join, making it seem only right that current VCDX certified individuals have a say in who else shares the same light. If you hold prior certifications, you just have to pass the exam to maintain an updated certification at the next level. For instance, this past example was for the VCDX6-DCV certification. That is the level 6 certification that aligns with the latest update. If you have no prior VCDX certifications, you have to go through all six steps mentioned above. 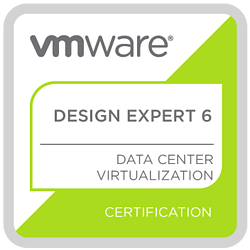 If you have the VCDX5-DCV certification, all you have to do to maintain the VCDX certification and be level 6 certified is take the VCDX6-DCV certification exam. Watch the following video, “VMware Certification Story: Mark Gabryjelski, VCDX #23” to hear about Mark's journey to becoming VCDX #23, how it has benefited him, and to hear some tips he has for others hoping to earn a VCDX certification. The certification requires the individual to write a design. Writing a design sounds simple and you could draw a few icons, but that's not what they are looking for. They are looking for someone to come in and be able to articulate business cases, constraints, risks, assumptions, thorough design, articulate how the design is built from the hardware perspective, to the connectivity perspective, to the SLAs that come around it, backup, recovery, and DR, if that's part of the design. You have to design all that and justify your decisions about why you are using certain components versus others and why certain software settings are tuned in a certain way. You also have to create an implementation guide. Not only do you design it, but you have to write the implementation guide that you would hand off to a team member with the expectation of them being able to fulfill your design. The next step is taking that design and submitting it to VMware for approval. Once you get approved, you either pass or fail at this point. If you fail, you just rewrite your design and resubmit. If it is approved, it means they see that you have the ability to be a VCDX. The next step is you have to go and defend. A defense involves you going and sitting in front of three panelists that validate you created the design and that you understand the concepts, constraints, risks, and the things you articulated in that design. This is tested by taking park in an on the fly designed Q and A with them. It is not the easiest road to get certified, but it is an incredibly rewarding road. Many people do have the necessary skillset, but struggle with the documentation piece. People start in different areas to work through these certifications. Many recommend starting with the data center certification because if you start with data center and then move onto the others, it seems like a more realistic journey. In order to do the cloud management or the desktop mobility certifications, you need to thoroughly understand vSphere. If you don't have a data center vSphere VCDX, then you end up trying to do both of those in the same breath. If you can go and do a vSphere data center focused VCDX submission, you'll have an easier time because then if you go and you do a second or third VCDX, you don't have to do the defense. You have to write the same design, but then at that point it's just a quick phone call to make sure that you've written the design yourself and validated it. If you went through the full Q&A and defense already, then the panelists have already proven, since you passed your first VCDX, that you can handle yourself in front of a tough crowd. They don't need to do that again. That is a huge time investment for everyone involved, so now they just conduct a quick phone call to make sure you're the actual person who did the submission. This certification validates you as a confident leader of your peers in the space. Many of the early VCDX certification holders have worked with Mark personally in the VMware ecosystem since 2001, 2002, or as they are boarded. As one of the earliest contributors, he has been around and practicing VMware's virtualization solutions longer than most people have been employed there and he has seen the value it brings to certified individuals first-hand. Being able to say, "yes, I'm capable, and I'm confident I can lead my customers through a solution correctly," is significant. As the 23rd individual to get this certification out of 269 total, Mark has been a leader and helped many others along this journey. He even went as far as partnering with other experts to write a book to help people through this process. Partnering with an IT company with VCDX certified employees is a smart move. It is a comprehensive certification program handed out to only the most sophisticated architects and problem solvers. They have to know how the software applies to numerous real-world business problems to be able to offer best-in-class solutions. Partnering with a VCDX certified individual is the only true way to absolutely guarantee you are working with the most knowledgeable people in the virtualization world. Next Steps: Stay up to date with VMware happenings and the evolution of virtualization by following Mark Gabryjelski on Twitter (@MarkGabbs). Since 1996, Mark Gabryjelski has been involved in design and integration of solutions for clients in all markets. With a focus on datacenter optimization, he has worked with companies across all aspects of business. Mark has been leading the virtualization trend since 2001 nationally, with a focus in the Northeast corridor. He continues to be on the bleeding edge of solutions involving network, storage, server, operating system, and application virtualization. Mark is currently the Virtualization Practice Manager at Worldcom Exchange.